Cybercrime and cyber insecurity are profound and urgent challenges to our justice system and our way of life. Read on . . .
Download a complete .pdf of SJM11. Printing off is best done in colour. 6MB. Editorial: guest editors Ian Ferguson and Natalie Coull argue that as many of the digital services that we interact with are increasingly globalised, there is a need for frameworks, legal processes and policies to recognise and deal with the new challenges that these present. 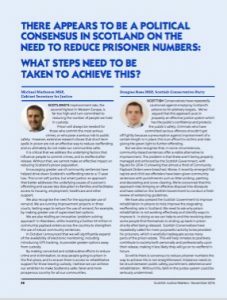 In this issue they set out to give a snapshot of Scotland’s readiness to deal with ‘cybercrime’ and to provoke debate on the current legislation and resources. Senior criminal justice social worker, Stephen Lindsay, outlines the implications of internet offending for the practice of social work, focusing on sexual offending. Scot Dignan shares some of the practical questions facing prosecutors in terms of evidence and presentation of offending in which social media is an element. Defence solicitor David Sinclair, considers the evidential power of the smartphone in your pocket and the question of personal privacy. Mandy Haeburn-Little describes the work of the Scottish Business Resilience Centre as it attempts to protect our small business economy from cyber threats. Detective Inspector (Cybercrime) Eamonn Keane describes how the scale, volume and globalisation of internet crime pose challenges to policing. 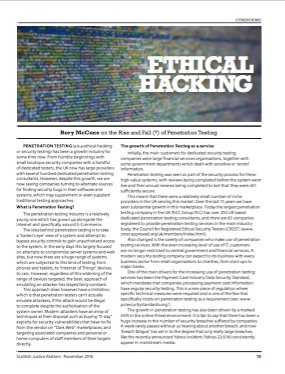 Rory McCune explores the world of ‘ethical hackers’ and bug bounties and how these are been used to test security systems. Ethical Hacking. The Rise and Fall (?) of Penetration Testing. Psychologist Ethel Quayle outlines what we know about online child abuse and exploitation. Online Child Abuse and Exploitation. 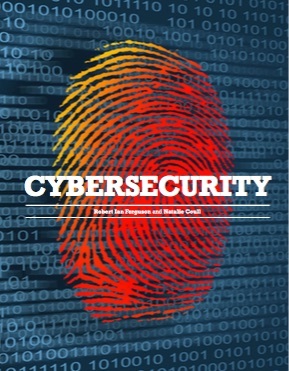 Shane Horgan and Ben Collier dig deeper into questions of cybersecurity and argue that to be cyberesilient Scotland requires a strategy that addresses the complexity of economic, cultural and social relations. Barriers to a ‘Cyberaware’ Scotland. Steven Wilson, Head of Europol’s Cyber Crime Centre, considers the importance of a digitally skilled population in achieving cybersecurity and resilience. Digital and Cybersecurity in Scotland: a view from Europe. David Cross argues that questions of human rights need to be considered in the context of criminal justice social work practice and community justice. 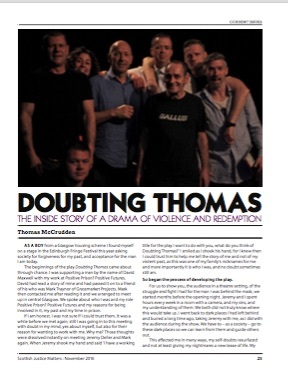 Thomas McCrudden writes on the origin of the 2016 Edinburgh Fringe drama focusing on his life story and what the project has meant to him and the other actors. Doubting Thomas. The Inside Story of a Drama of Violence and Redemption. In a follow up to an earlier article Ondine Tennant sets out the new SSC’s initial work plan and focus. 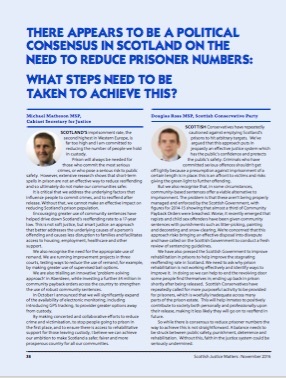 The Scottish Sentencing Council: plans and priorities 2015-18. Public health experts Emily Tweed, Emilia Crighton, Mark Rodgers and Saket Priyadarshi report on the explosion in HIV related to public drug use in Glasgow and argue that a solution is to set up a safer consumption and heroin assist service. Angela Voulgari, of Sacro’s Bright Choices project, explains its work with so-called hard to reach people. Retired social worker Jean Skinner observes present day court procedure as it impacts on women and is not impressed. Hazel Croall on The Corporate Criminal: Why Corporations Must Be Abolished.